Paul holds the WM&CI (Winter mountaineering & Climbing Instructor). He is a full member of AMI and registered with the Mountain Instructors Community. Paul has personal and instructing experience throughout the UK. Having grown up in Derbyshire he holds a particular love for the Gritstone climbing in the Peak District. He currently lives in Wales in the summer and heads north in the winter to enjoy all that Scotland has on offer. Paul is also a Kayak and Canoe coach (Level 2) and 4* Inland Kayaker, Level 2 Orienteering coach and Dry Slope Ski Instructor. Paul started his instructing at a young age, as a black belt in Karate he was a Karate Sensei (instructor) in his late teens. After finishing a Chemistry degree at Durham University, Paul moved onto climbing instruction working at Nottingham's climbing wall. 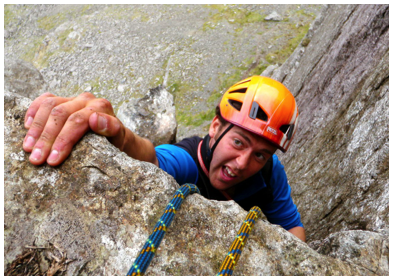 Since then he has spent a period of time working at Plas y Brenin, furthering his qualifications and gaining experience in climbing, mountain walking, canoeing, kayaking and skiing. For the last year or so Paul has been working freelance at a variety of centres in Wales and the Peak District, including Plas y Brenin, Dolawen, World Challenge Expeditions, Arthog OEC, Marle Hall OEC and Outlook Expeditions as well as a variety of private companies offering climbing and mountaineering courses. Climbing wise Paul has climbed extensively around Britain in summer and winter. He particularly enjoys winter climbing in the Scottish Highlands but also rock climbing on the coastline of Holyhead at Gogarth. Overseas Paul has enjoyed the delights of the granite on offer in California from Yosemite to Joshua Tree. In the Alps he has accomplished some classic north faces including the Cassin route on the Piz Badile and an ascent of the classic Courtier Couloir on the Aiguille Verte. Paul has a patient approach to his teaching and carefully plans his day to make sure you will have an enjoyable learning experience.